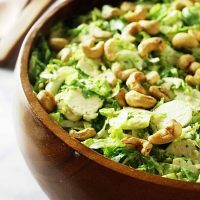 This shaved brussels sprout salad with caesar salad dressing is crisp and crunchy with a tangy, creamy caesar dressing. 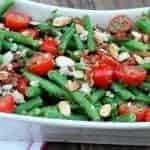 It is a great salad to make in advance since it won’t wilt like lettuce. When our kids were growing up they were not that keen on brussels sprouts but I finally learned, quite by accident, that if I called them ‘baby cabbages’ they would eat them excitedly. Isn’t it curious how we adults learn to manipulate our kids’ ideas on food. I do confess though, I was an adult before I learned to enjoy brussels sprouts. I have also learned how healthy they are for you! For instance, if they are steamed they have a cholesterol-lowering benefit, they are high in fiber, and recent research indicates they may also be a protection to cancer. Dahn and I spent a fun day together last week and went shopping in Seattle. We stopped for lunch in a lovely restaurant and ordered their brussels sprout salad. 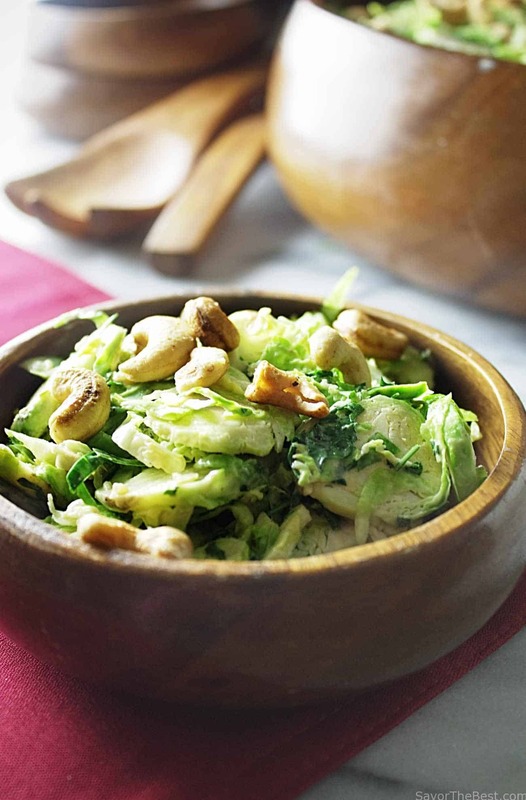 The shaved brussels created a light and delicate slaw that was tossed with a caesar dressing. That salad was so good that it inspired me to create one at home. I used the thinnest slicing attachment to my food processor to shave these little guys. 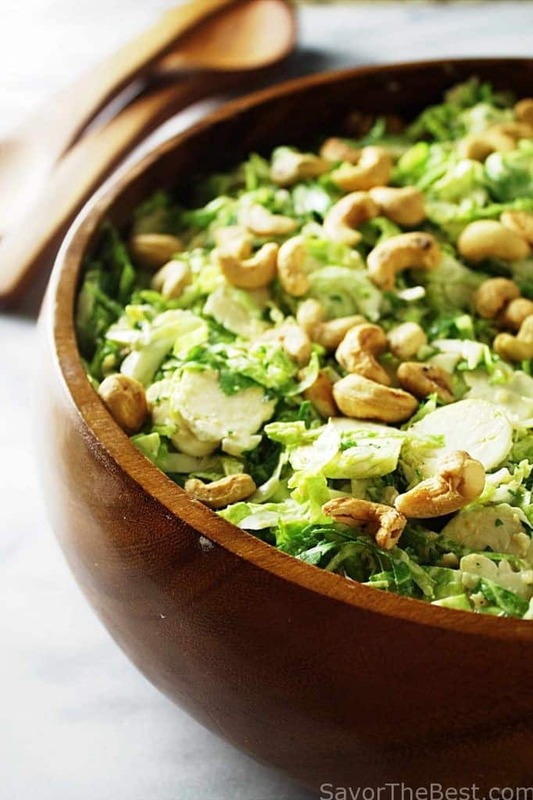 This salad has a creamy caesar dressing tossed over a fluffy cloud of shaved brussels sprouts, chopped parsley and finally sprinkled with crunchy cashews. 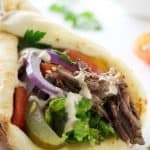 It is great at lunch-time, a snack or included as a main meal. 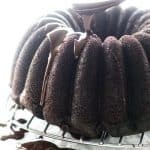 I can even imagine Dahn eating it for breakfast! I hope you enjoy this salad as much as I have. Wash the brussels sprouts, trim the ends and remove any discolored leaves. Slice the brussels spouts just as thin as you possibly can with either a food processor or a mandolin. 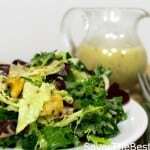 Transfer to a large salad bowl, add the chopped parsley and set aside while you make the dressing. In a large bowl add the minced garlic, salt and the anchovies. Using the back of a fork, mash and mix the garlic, salt and anchovies until you have a paste. Mix in the mustards and worcestershire sauce. 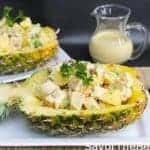 With a small whip mix in the lemon juice, olive oil and the mayonnaise until well incorporated, thick and creamy. 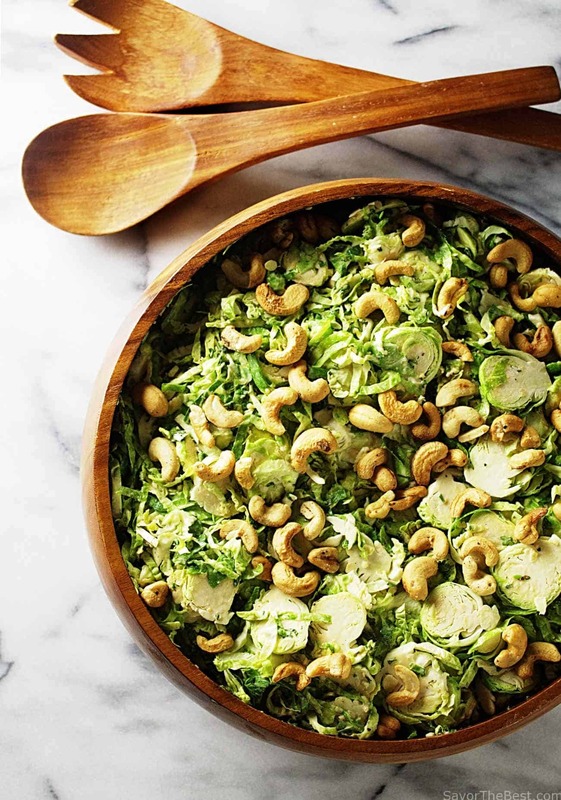 Pour the dressing over the shaved brussels sprouts, add the cashew nuts and toss together. This is delish! I’m so glad you posted it, we love Brussels sprouts and this certainly will be a favorite of ours. kI thought the anchovies wouldn’t smash, but kept at it, and they cooperated. I’m thankful for you two and this wonderful site, my go-to when I’m looking for something different and new. I grew up when all Brussels sprouts were cooked to death. So very few people I knew liked them. 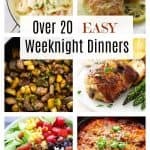 It took me years before I could face them, but once I started cooking them — by NOT overcooking them! — I really grew to love them. 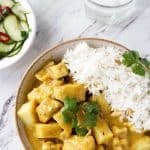 Terrific recipe, thanks. BTW, I’m taking off the rest of the year, so I’d like to wish you happy holidays!